National Scrabble Day is observed annually on April 13th. Being that over 150 million copies of Scrabble have been sold across the globe, it is a game that truly deserves to be recognized! Make sure you honor this beloved game by playing some Scrabble on April 13th! Also, don’t forget to use the hashtag #NationalScrabbleDay on social media when you post about this special day! National Scrabble Day is observed annually on April 13th. April 13th specifically was chosen in honor of Scrabble’s inventor, Alfred Mosher Butts. Butts was born on April 13th, 1899. 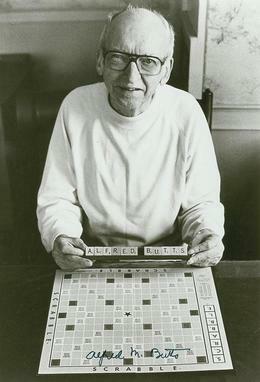 Alfred Mosher Butts photographed with Scrabble game. #NationalScrabbleDay: an excuse to play Scrabble all. day. long. Cant play this one without a blank tile...Only two Z tiles are in the Scrabble bag. Even the *(past/current) Super Bowl Champs got in on the action. Scrabble has a rich history since being created in 1933 by an out of work architect named Alfred Mosher Butts.During the Great Depression in 1938, Butts, an unemployed architect, created a word game that combined crossword puzzles and anagrams. He originally named the game Lexiko, but the game had the same amount of letters and had the same point values that Scrabble still has today. Butts came up with the distribution and the point values for the letters by studying the New York Times and completing a frequency analysis. Then, he later added the 15x15 game board and changed the name to Criss-Cross Words. Not until 1948 did the game become popular. This happened when James Brunot, a friend of Butts and one of the few people to own Criss-Cross Words at this time, bought the rights to manufacture the game. Brunot officially changed the name to Scrabble and Butts received a royalty for every copy sold. In 1952 it surged in popularity when the president of Macy’s discovered the game and decided to carry it in stores. A few years later, Brunot sold the manufacturing rights to Salchow and Righter and it eventually became a product of Hasbro. Today, it is the ranked as the second best board game in United States History and it was inducted into the American National Toy Hall of Fame in 2004. •	Alfred Mosher Butts created the original wood tiles all on his own. He cut them out and put the letters on by hand! •	Oxyphenbutazone is the highest scoring word that can be played in Scrabble. It is worth a whopping 1778 points! Scrabble is played with two to four players who score points by taking the individual lettered tiles and forming them into words by placing the tiles onto the game board which contains a grid of squares. The tiles have to be placed in crossword fashion and read left to right in rows or downward columns. The words must also be found in a standard dictionary or lexicon. Official Scrabble Website - Browse around, purchase etc. The Scrabble word finder - Help unscrambling letters. Scrabble's Wikipedia Page - You know what it is. Get Scrabble on the App Store - iOS version (Apple). Get Scrabble on the App Store - Android version. National Scrabble Day is celebrated annually on April 13th. This site has no affiliation with Hasbro or Mattel.